This makes a 12" block, and is paper pieced! Aunt Rachel must have been CRAZY to do this, but what the heck...Let's try it anyways! Do a test block! The first thing that I would recommend that you do, is go to the Practice Paper Piecing Page. 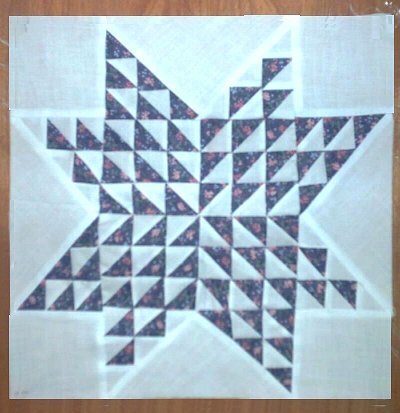 When you feel comfy with paper piecing, come on back and try Aunt Rachel's Star! You will need to print out four copies the "B" template page, and copies as marked on each template on the "A" page per block you want to make on very lightweight paper. After your units are all paper pieced, sew together the center square rows, pressing seams in alternating directions. Join the Star Pt. Left /Star Pt Left B and Star Pt Right /Star Pt right B units. ( not shown) Now piece the block. Row 1 = Corner sq/ Star Pt Left /Triangle/ Star Pt Right / Corner square. Row 2 = Star Pts Triangle unit / Center square unit /Star Pts/Triangle unit. Row three is another row one, but flipped over! Here's one that Fran made!